See also update in second half of this post with updated info. - stores should budget for a large outlay at some time after that. What that means is to anyones speculation. This could be a change of pots, a change of the paint rack, or something bigger. That's all I have at the moment. If you want to be on the safe side and have one colour you absolutely need for your army, you might want to stock this colour in case some colours are discontinued. 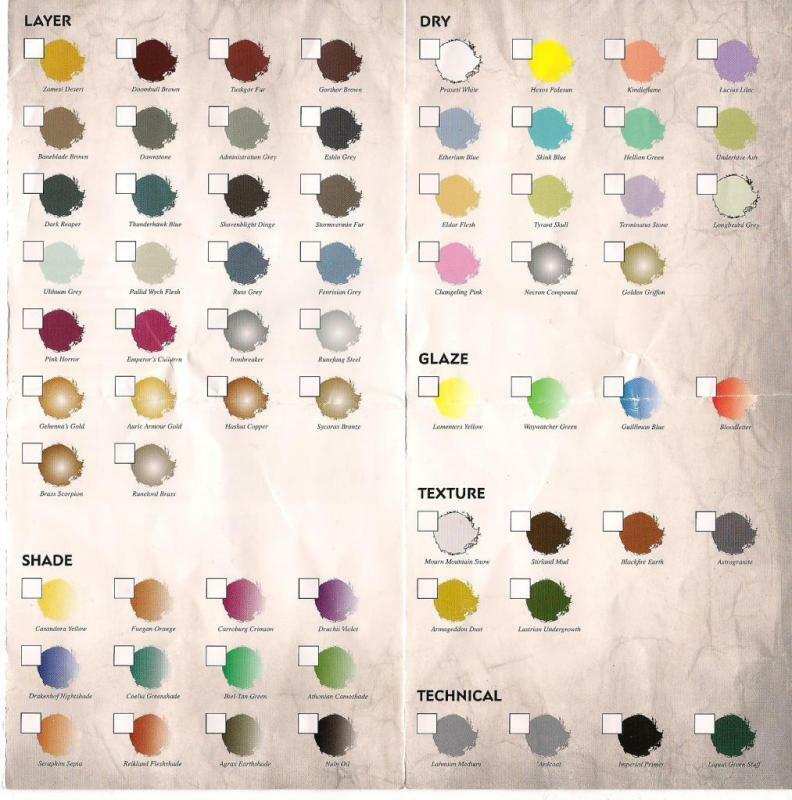 Or you consult this table of alternative paints: http://www.dakkadakka.com/wiki/en/Paint_Range_Compatibility_Chart . The above message to stores is fact. It's getting spring, the birds sing more often. Salt to be applied as usual. Romanus wrote: Hey Guys, just to chime in, the paint range is being increased to around 150 paints (147 was the number I heard), coming out in April, other rumblings on a store level but want bore you with any of that. 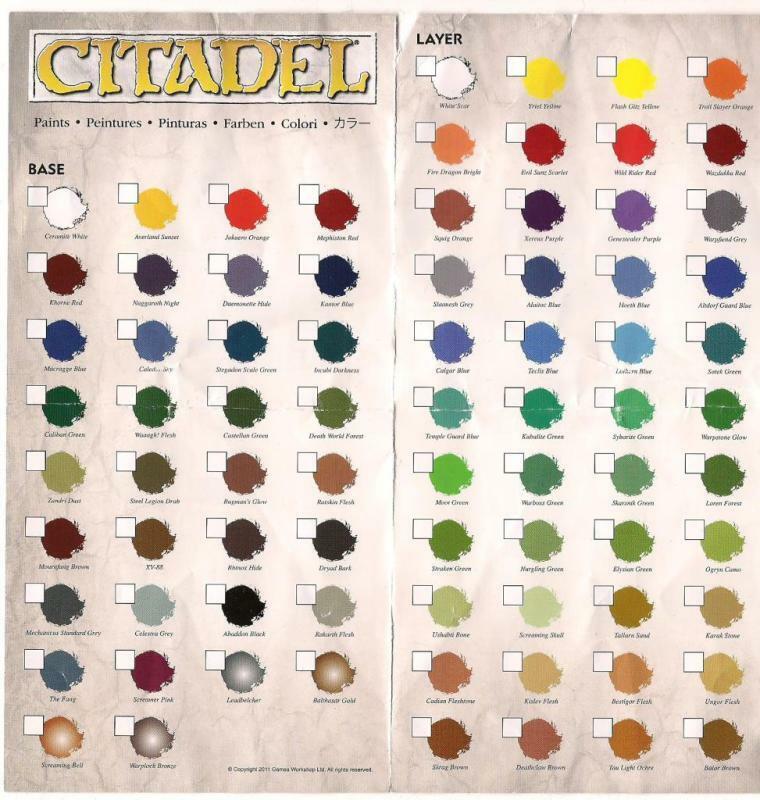 straightsilver wrote: I have heard that the new Citadel Paints will be the high density pigment variety, so very similar to the current line of P3 paints. They have a much better coverage over black undercoat and the colours are more vibrant, especially on reds and yellows. I suppose they could be considered halfway between a foundation paint and the current ones. It looks like the pots they come in are pretty much staying the same though, which is unfortunate as they tend to dry out very quickly. 1.) New paints released in April (not March), preorders end of March. Information to FLGS end of March. 2.) Current colour range will roughly stay the same, but quality, formula and names will change due to a new manufacturer. Pots will probably stay the same. This range corresponds to "GW stockist outlet" module #2 . 3.) New colours will be released, pushing the total to around 150. There will be subcategories like foundation, layering, washes. 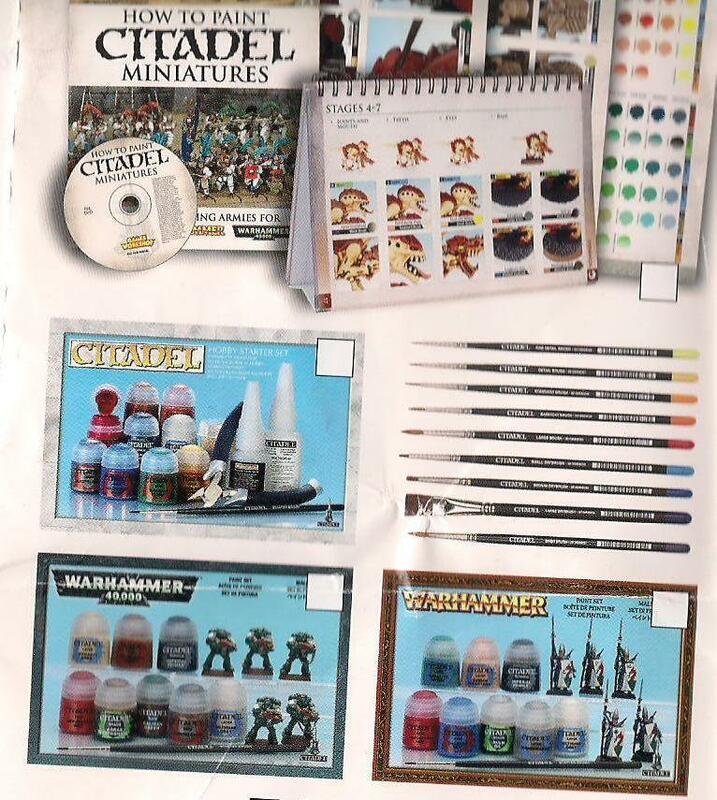 Having this extended range of paints corresponds to the ""GW Stockist Outlet" module #5. Yakface wrote: I got this info passed onto me about the new GW paint changes. -lots of renaming of colours, nothing is leaving. -All in different catagories now, Shades (washes) bases, layers, glazes (thin washes) and textures. -Prices are staying the same. • There are 144 paints (the current line is only 73), so the range is doubling in size. • Broken down into Bases (foundations), Layers (normal colours), shades (washes), Dry (essentially goopy paint for dry brushing), Glaze (thinned washes for easier blending), Texture (sand + colour) and Technical (liquid green stuff). • Bottles are not changing. • Every color is renamed, there will be a white dwarf with a comparison guide released. Blood red is now wild rider red, ultramarine blue is Calgar blue, skull white is white scar etc etc. There is a big expansion in the greens. There are pinks again, and more purple. • Mega paint set available year round now, but is super expensive apparently. Prices are apparently the same (for now). Will be a thin plastic glue with metal pin, for applying to smaller parts. Plus a thick super glue, for applying to larger parts and with the ability to fill small gaps. Same volume as the resp. other glues, about the same price (plastic glue a tad more expensive). heard this yesterday at my shop as well. Apparently the entire paint line is going to be changed, something with the formula. I'm simply praying they go back to a similar pot they used to have cannot stand these new pots. Other than the GW washes, the only paint in their range that I will use (mainly due to their current pots) is their Bright yellow... I love it. The Bright Yellow is, imo, their best paint. I just hope they copy a lot of other good paint products and go dropper bottle style. I like a variety of paints for different uses, but I hate my GW paint dry out. Not to mention the need for power tools to get some of the old screw top bottles open. The only thing I hope they don't do is change the formula they use for their washes. They're by far the best thing in their paint range. The one color that I use the most is shadow grey. Guess its time to pick some up this weekend. vinsal wrote: I just hope they copy a lot of other good paint products and go dropper bottle style. Dropper bottles are nice but that sounds like a great excuse for gw to jack up prices by at least a dollar or so more! This is mind-blowing. Didn't GW just recently change their paint-pots yet again to conform the normal paints to their Foundations and Washes? The buy Vallejo. They're colour matched to GW. The only things GW's range does better are foundation paints and washes. I hope it means ..
2. or better yet, they gave up and switched to Vallejo, and renamed them to Droppa Pots. I sincerely doubt they're changing their paint pots. They're probably going to drop some colors and get some new ones/old ones mixed in. Maybe switching manufacturer unless they did so when they changed their pots last? Though they could have found a cheaper formula and just go with that to make a little extra cash. I'm sort of hoping it's an improvement on the existing one. Though if not it'll just get me to swap over even faster. Will the new range be called FineDetail or something like that? Horribly miscast pots that don’t open properly (or close once open). Maybe the colour in every 4th or 5th pot is a little off what it should be? Anyway, all this says to me is "Buy two pots of Liquid Talent and call it a day". Thanks for that thought CT. Now I have to go buy two more pots of it just in case this actually happens. Fear-induced purchases; ugh. Hmm, better take inventory here, see if I need anything. I can't wait to buy one of these, open the box, peek at the sprues, and then put it back in the box and store it unpainted for years. H.B.M.C. wrote: Will the new range be called FineDetail or something like that? Horribly miscast pots that don’t open properly (or close once open). Maybe the colour in every 4th or 5th pot is a little off what it should be? Months later they sell a kit containing some pigment to mix into some of the paints to fix them yourself. No thread is complete without some totally unique, witty and knee slappingly hilarious Finecast/Failcast/Finecost/etc. jokes! Despite it being not in one part related to the topic on hand, we need some in every thread! I get that you don't like it, I think its poorly implemented as well, but bringing it up at every opportunity is getting tiresome and adds nothing to the overall conversation. There is an entire thread dedicated to that discussion, I believe. Please don't touch Washes and Foundation paints! I really hope they don't change the formula. I love the properties of their paint as they are now. I own a set of Vallejo paints as well because they have a broader range of colours, but I've never been as happy with the properties. Vallejo and P3 are both terrific---although they both have small pot issues as well. Vallejo has that "Is it coming out or..." *SPLOTCH* affect--and P3's lids seem to snap pretty easy. Of the 3, P3 is becoming my fav though--takes to glaze medium and mixing quite well. Necros wrote: I hope it means ..
You're the kind of person who complains that their paints dry out. Absolutionis wrote: This is mind-blowing. Didn't GW just recently change their paint-pots yet again to conform the normal paints to their Foundations and Washes? Brother SRM wrote: I sincerely doubt they're changing their paint pots. They're probably going to drop some colors and get some new ones/old ones mixed in. they will have a new pot called Paint Thinna [to fit in with 'ard coat] It will be used to thin paints. It will be composed of semi-pure Dihydrogenmonoxide. They will charge 7 dollars a bottle, just to show how special the product is. I hope they don't switch to dropper tops. AgeOfEgos wrote: Bring back Brazen Brass! I'll second and third that. It annoys me to no end when I go to grab a new pot of scaley green or brazen brass to be told they don't make it anymore. I found alternatives that are reasonably close, but I still prefer the GW stuff. Scipio Africanus wrote: You're the kind of person who complains that their paints dry out. Mastiff wrote: I'll second and third that. It annoys me to no end when I go to grab a new pot of scaley green or brazen brass to be told they don't make it anymore. Have you tried Coat D'Arms, which are the old colours in the old-style pots with slightly tweaked names?